The Boston College Eagles (9-0) remain undefeated and the undisputed number one team in the Division I Coaches Poll this week. The top four teams all held their position, with Maryland (8-0), North Carolina (7-1), and Syracuse (8-2) following right behind Boston College. Northwestern (5-3) moved into the top five, Penn (7-1) jumped two spots to number six, and James Madison (7-1) sat tight at #7. Virginia (7-3) fell to the eighth spot after losing a thriller to Notre Dame, 10-9. Princeton (4-1) remains ninth, and Michigan (10-0) enters the top ten for the first time after knocking off Penn State last weekend. Notre Dame (8-0) made the biggest jump of the week, moving up to land at #12. We kick off Top-25 games on Tuesday, when Princeton (#9) travels to #16 Florida. Wednesday sees #8 Virginia visiting in-state rival James Madison (#7), and #22 Georgetown road-tripping to #11 Loyola, while the second ranked Terps visit #23 Penn State on Thursday. 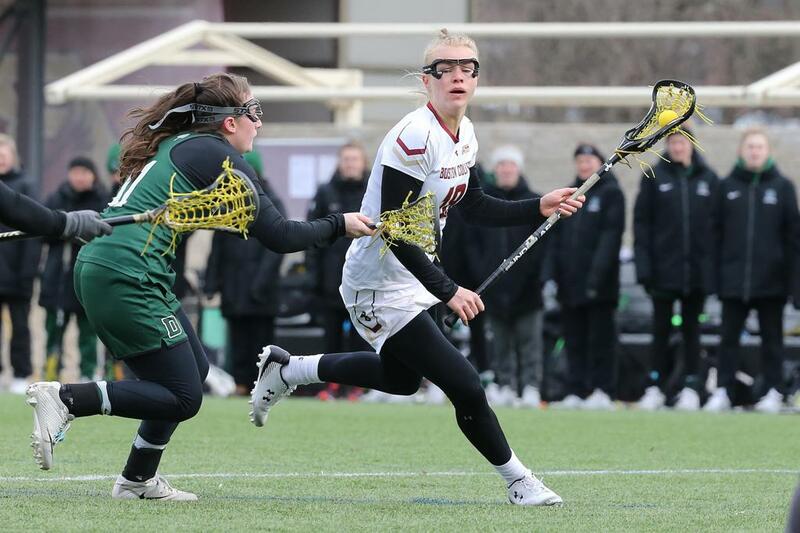 The weekend’s games include #1 Boston College at #3 North Carolina, Florida at #17 Stony Brook, #12 Notre Dame at #4 Syracuse, Duke #13 at Virginia, and Maryland at James Madison.